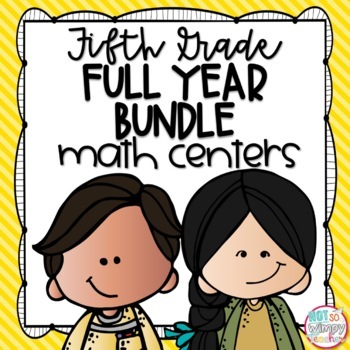 I am super pumped about this math center blog post series! Math centers and guided math groups are the heart and soul of my math instruction. I can't imagine teaching without them! 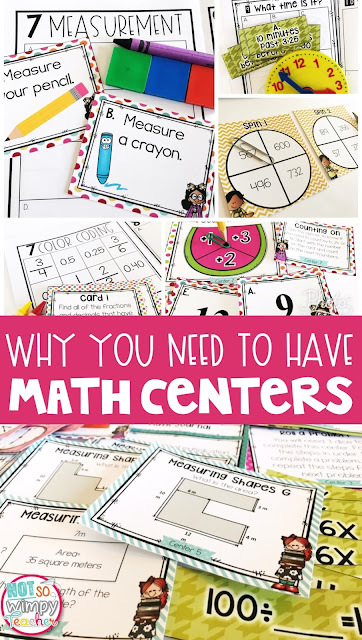 I often hear teachers say that they don't have time for math centers. I honestly feel that, if you are doing centers correctly, you don't have the time NOT to do centers. When all we do is teach math whole group- we can't meet all of the individual needs of our learners. It makes our lessons a "one size fits all." We are actually wasting precious classroom time. When we do a quick whole group lesson and then move into small groups and centers, we can help kiddos with exactly what they need. The groups are leveled so that we can reteach a skill for one group and extend the skill for another group. The groups are not taking away from your time for teaching curriculum. Instead, groups are making your curriculum more individualized for your learners. I love using manipulatives (tiles, base ten blocks, place value discs, fraction bars, etc) to help solidify a skill or concept. It makes math more engaging and meaningful. However, I am not a huge fan of using manipulatives whole group. They take time to pass out and collect. You are not able to carefully watch each student use the manipulatives and guarantee that they are being used to correctly represent the problem. On the other hand, I love using manipulatives in small group! I keep my most used manipulatives next to my small group table. I can hand them out in a matter of seconds. As students are building and experimenting with the manipulatives, I am able to easily see what they are doing and gage their understanding of the skill. I can quickly make corrections and model the skill. 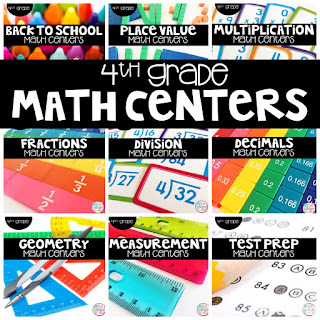 If you have some technology, but are not 1:1, then centers are the perfect way to get the best use out of your devices! Four-six devices are all you need for a simple center! There are several great apps and websites that will give your students practice with math skills. Many of them will even produce reports for you to see how students are performing. 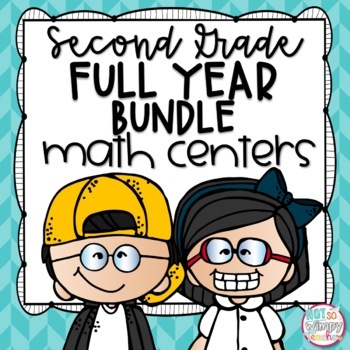 I recommend Zearn, xTra Math and Moby Max. I love to teach math in units of study because I think that it makes it easier for my students to focus on one skill and master it before they move on to the next skill. That being said, if they don't continue to review the skills that have been previously taught, they will be forgotten. Centers give students the opportunity to practice a skill that was taught earlier in the year. We may be doing fractions whole group, but they are doing multiplication center activities. This helps them to be independent and successful during centers, but it also helps to make the concepts more concrete and committed to memory. When students just sit in desks and complete worksheets, they quickly become bored and disengaged. When students are not engaged, lessons will take longer and behavior issues are likely to pop up. Centers are very engaging. Students can get out of their seats and move from one activity to another. They are hands-on activities that might include technology, games, sorts and such. The activities are fun for learners. When students are having fun, they will have increased productivity and memory. Win! 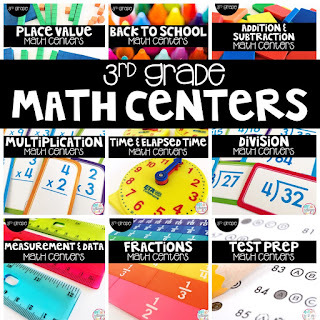 Hopefully I have convinced most of you that math centers and groups are A MUST. Now you need to come up with a simple routine and center activities that will be meaningful! Check out the next post in the series to learn about the activities that my students complete during center time!